On March 15th, 2012, compliance with Title III of the 2010 Americans with Disabilities Act (ADA) Standards – the first comprehensive update to federal accessibilities standards since the original standards were written into law by George H.W. Bush in 1991 – becomes mandatory. Published in the Federal Register on September 15, 2010 Title III, primarily section 5, guarantees persons with disabilities are provided accommodations and access equal to, or similar to, the general public into commercial facilities and areas of public accommodation. In order to help facilitate a less confusing and potentially expensive transition, the U. S. Department of Justice (DOJ) has allowed for one year’s time for business to prepare for the changes, and have exempted (grandfathered) building elements constructed or altered in accordance with 1991 standards until such time that a planned alteration of those elements is completed. Also, “good faith” efforts on the part of a business to comply with the new ADA regulation will be given consideration in any judicial review where compliance has yet to be achieved. As with the 1991 ADA standards, the 2010 updates are enforceable under civil rights law; meaning that a person is able to file lawsuit if he/she has “reasonable grounds” for believing that discrimination is about to occur, rather than filing a grievance after the fact. Corrective action is traditionally imposed for first time offenses, but if the DOJ has reasonable cause to believe someone has engaged in a pattern or practice of discrimination in violation of the ADA, a civil law suit can be filed with penalties of up to $100,000 imposed per offense. Per the 2010 ADA, businesses that provide goods or services directly to the public will be required to remove architectural barriers in existing buildings, and must make sure that newly built or altered facilities are constructed to be accessible. Commercial facilities, such as office buildings, that do not provide goods/services directly to the public, are only subject to new construction and alteration requirements. It is important for the line striping professional to not only have a strong working knowledge of the Title III Standards in order to ensure compliant work is performed, but also to be able to recognize parking lot ADA compliance issues, and to be proactive in explaining the new standards to property owners. Though the there are numerous sources of information on ADA standards available online, the most inclusive and unbiased data on the new ADA standards can be done on the ADA homepage of the U.S. Department of Justice website (http://www.ada.gov/). Per section 5 of the 2010 ADA Standards, which contains those issues most concerning to the line striping professional, businesses with parking must provide accessible spaces for cars and vans if it is readily achievable to do so. Small businesses with very limited parking (four or fewer spaces) must have one accessible parking space; though no signage is required. 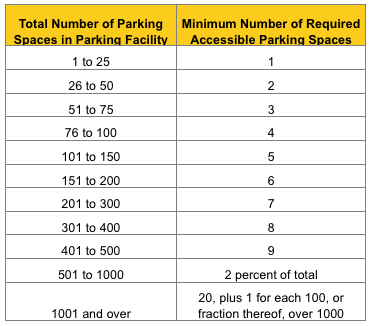 The following chart indicates the number of accessible spaces required by the 2010 Standards. One of every six spaces must be van accessible. Other specific ADA regulations will vary depending on location – primarily dealing with outpatient healthcare facilities and multi-unit residential lots where some or all stalls are allocated based on population. Compliance with the 2010 ADA standards not only requires clearly visible handicap spaces to be measured from the centers of the lines, but also requires standardized signs. Non-van accessible parking stalls need to be 8’ wide with a 60" aisle. For van-accessible parking, the van parking stall should be 11’, with a 60" access isle. You may also choose to have a 108" van parking stall with a 96" access isle. The van space must be marked as being van accessible by a sign that is both visible to drivers and more than 80" from the ground. The slope for both the access aisle and the parking space need to be on the same level and the slopes cannot be greater than 1:48 inches in any direction. Van lifts won’t deploy if it detects that the ground is uneven. Disabled parking signs are required on all accessible parking spaces, and should be easily visible (not blocked by landscaping, etc. ), a minimum of 60" off the ground, but low enough that they are visible from the driver's seat.